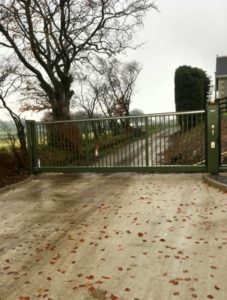 Inova Gates Limited have just completed another Sliding Gate and matching Security Fencing installation on behalf of H McLarnon & Sons Ltd in Ballymena. 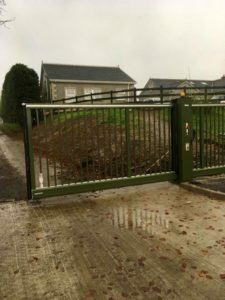 The project comprised of a new Cantilevered INOVA Silverline sliding gate 2000mm high with a clear opening of 6000mm. The gate was specially coated to match their new purpose built warehouse in Olive Green RAL 6003. 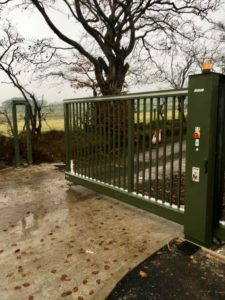 In addition to the Sliding Gate we installed new Perimeter Security Fencing 2000mm high also coated in the unique Olive Green RAL 6003 complimenting the entrance gate and providing the complete security package around their commercial premises.